Mammalian genomes encode over a thousand RNA-binding proteins (RBPs) that play important roles in RNA processing and metabolism. RBPs functions in diverse aspects of co-transcriptional and post-transcriptional regulation of gene expression. In recent years, there have been extensive studies trying to identify and characterize RBPs using high-throughput methods. 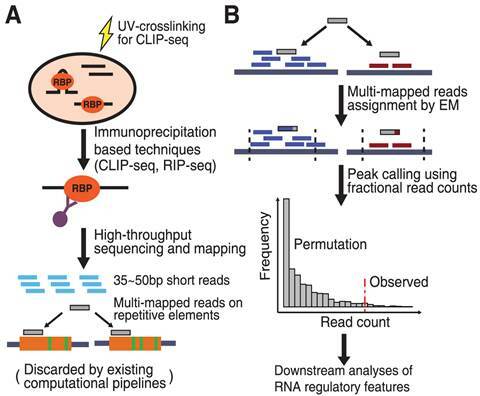 UV cross-linking immuno-precipitation combined with high-throughput sequencing (CLIP-seq) is a revolutionary technology to characterize the interactions between RNA molecules and RNA-binding proteins in vivo. The main principle is based on the fact that RNA molecules and their binding proteins can be cross-linked stably under UV irradiation. Therefore we can use specific antibody against the RNA binding proteins to precipitate RNA- protein complexes, and then the RNA fragment can be recovered for sequencing and analysis. Reverse transcription is often interrupted at the protein-RNA crosslink site. By performing an additional adapter ligation step, CLIP can be used to identify transcriptome-wide binding sites and binding motifs at single-nucleotide resolution. 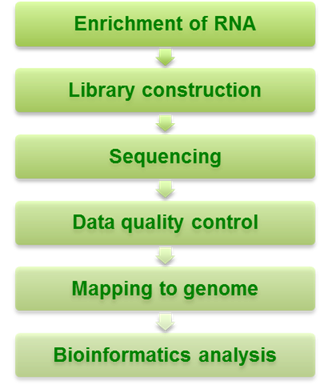 Creative BioMart performs bioinformatics analysis and data mining of various omics and other biological datasets. We assist the researchers with the integration of omics data with clinical information and develop analytical models for these data based on the hypothesis of interest. Our goal with bioinformatics service is to help researchers do cutting edge bioinformatics data analysis without a significant investment in laboratory. You can be assured that you are getting the best practice that Creative BioMart has to offer. CLIP-seq analysis usually starts with a series of well-defined processing steps, but the downstream steps need to be tailored and customized to specifically address the biological questions. Such questions can vary greatly depending on the studied protein and can involve analysis steps that have never been addressed before. Creative BioMart has experienced technicians, professional team equipped with supercomputing facilities that are capable of providing fully-customized analysis service.